Dear Blog Reader, I had quite the most amazing day yesterday. So amazing, I actually think I will need to cover it off in 3 blog posts! As part of my #12spasof2016 I had booked to go to the utterly fabulous Fletcher’s Cottage at Archerfield House. Now, I know I have been there a few times before, but I swear I seem to fall in love with this place more each time. It is nearly 3 years since I first went for a spa day there and ever since then I have made it my mission to one by one introduce my friends to it. For nearly 2 years I have wanted to take my good friend Miss Marketing Supremo (MS) with me but life and work got in the way …. until yesterday when we popped her Fletcher’s Cottage cherry. A few weeks ago when I visited MS and her lovely family, our trip planning began in earnest … it was pretty much the sole reason for my visit that day. I “made” her view the treatment menu for the spa online and we swiftly co-ordinated diaries to make sure she was off work and I was totally free of any childcare responsibilities. Before we knew it we had booked ourselves in for a veritable VOYA sandwich. 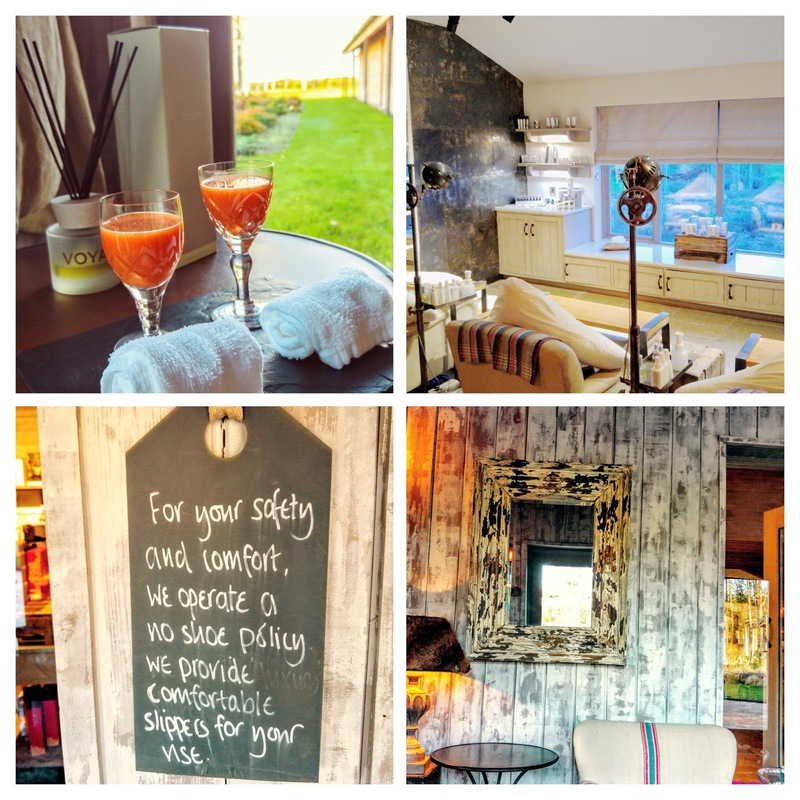 First up was the VOYA Detox Treatment and then the gorgeous VOYA Seaweed Bath Hut Experience … our day was well and truly all about VOYA. We excitedly kept each other up to date with our daily countdowns and when I met my delighted friend at Longniddry Station, we were not ashamed to have a mini jump up and down with elation. The fact we did so in a the station car park is a side point…. I may have also added in a little seal clap in for good measure. I love that you leave your shoes and worries at the door …. literally. When you enter the main door you take take seat, slip into a pair of towelling slippers, sip on your freshly made welcome drink and fill in your form about what you want to achieve on this visit. This process really helps you detach from the outside world. I had never noticed that the floor in this area had underfloor heating before …. my sleuth like companion spotted that immediately. “Really nice touch!” We were both amused that when filling out the form we basically circled every option about what we wanted to achieve in our skin. We wanted tightness, luminosity, hydration …. we wanted it all. Forms filled in, we took a moment to enjoy our drinks and be enveloped by the amazing aroma that wafts throughout this Spa. So calming and relaxing and always makes me feel at home instantly. I find it really hard to described Fletchers Cottage at Archerfield without first of all giving a relaxing sigh, then rattling off at high speed about how much I love going there. To me it is the place to go and get naturally rejuvenated, restored and ready for life again. There is something unequivocally special about this spa. The stunning coastal location. The peace. The tranquillity. The smell that wafts gently through the building. The staff. The feeling I get as soon as I see the sign at the entrance gate. As I leave the road and drive along the ….drive…. my shoulders always seem to instantly relax and I can already feel the stress of the outside world disappearing. By the time I get to park up outside Fletcher’s Cottage I am a heady combination of feeling relaxed like I have made it home after a long journey, but at the same time I am wanting to skip my way to the door because I am so excited to be back. Fletcher’s Cottage has nailed it. This spa is as close to perfection as I have seen. 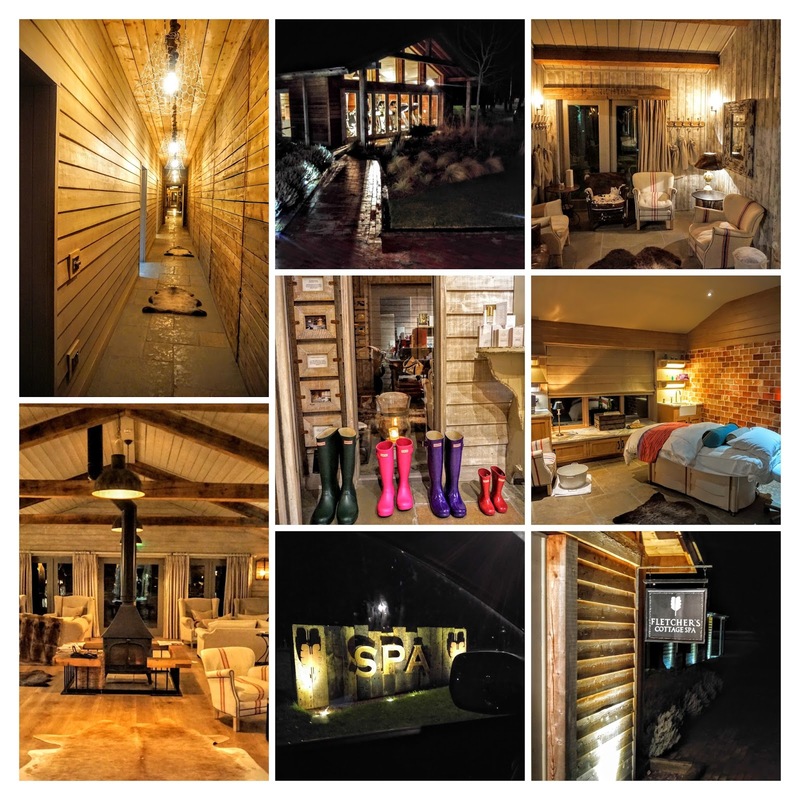 The owners of Archerfield House consulted with interior design and spa guru Sian Parry Jones who designed Fletcher’s Cottage Spa for them. She harnessed the essence of the building and its surroundings and mixed it along with her phenomenal attention to detail to create a seriously great spa. I love the exposed beams, neutral palette, mountain ski cabin luxe yet rustic vibe and am in awe of the use of reclaimed materials throughout the building. One of the best things about Fletcher’s Cottage is the natural daylight that permeates throughout. 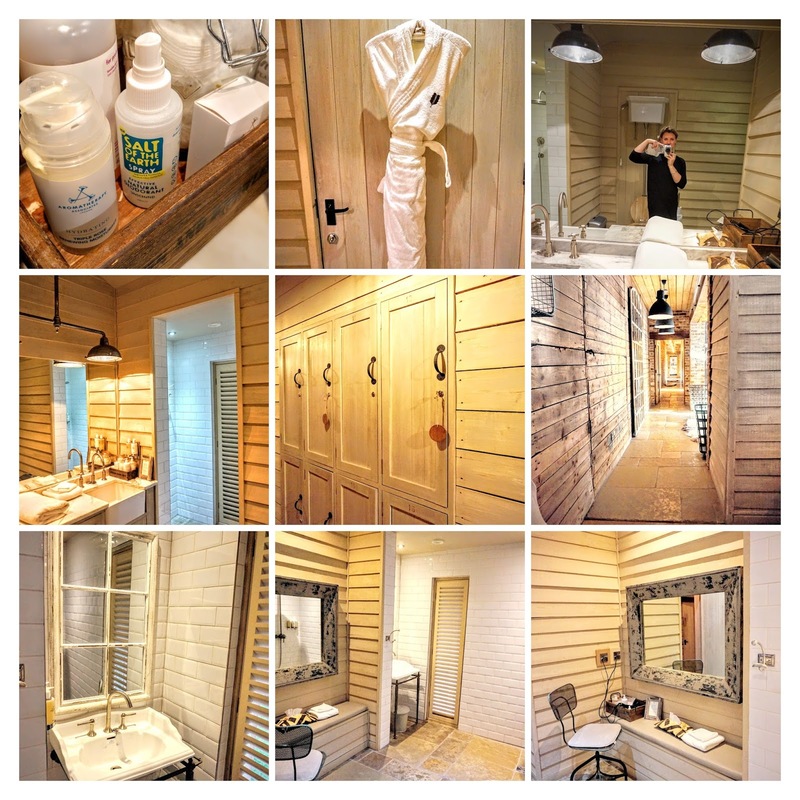 All the treatment rooms, the sauna, the relaxation areas, bath huts and changing rooms are all bathed in glorious natural light. In the sauna, for instance, you can look straight out into the amazing walled garden. There is something so therapeutic about this. I was delighted to, by chance, get to meet Sian on this visit. I was a little star struck to be honest. She created one of my favourite places in the world. I wasn’t just fan crushing, I was also minorly mortified that I spoke to her after my second treatment, with a lot of oil product in my hair, whilst wearing a fluffy robe and also at the point of being so relaxed that I could barely finish a sentence cohesively …. goodness knows what she made of my gibberish. 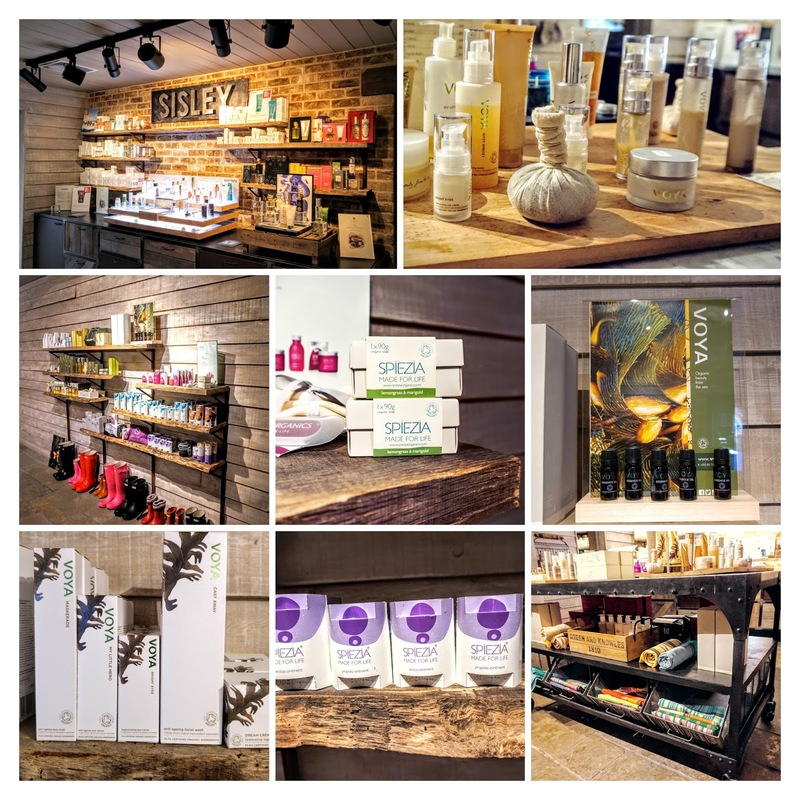 Better yet, Sian then went on to introduce me to none other than Amanda Barlow, MD of Spiezia Organics …. yes I was still in my fluffy robe and oily hair! There is a reason my best friends call this spa the “mother ship”. For me, going to Fletcher’s Cottage is like going to stay with a beloved family member or great friend. Fletcher’s Cottage brings you in, makes you feel cosseted, instantly makes you feel at ease, looks after your soul, rejuvenates you and by the time you leave you are the feeling like yourself again. This spa never fails to make me feel like a better me. It is very difficult not to fall for Fletcher’s Cottage as hard and fast as it makes you relax there. Yesterday we were greeted by Lisa who was to get us settled in and give us a tour. This was not the first time I had met Lisa. 3 years ago this month, my mum had just been diagnosed with breast cancer and I was invited to Fletcher’s Cottage for the very first time. Fletcher’s Cottage was just what I needed. Lisa was my therapist for a wonderful Spiezia treatment and I then went on to have my first ever VOYA Seaweed Bath. It was really lovely that it was Lisa showing us around again today. As I snapped away taking a load of pictures (…. ridiculous amount of pictures taken) Lisa talked MS through the Spa. After our mini-tour I could not wait to get to my changing room and get into my fluffy robe.When you think of changing rooms in spas you will probably get a vision of a communal room with lockers, not enough space for everyone’s stuff, some seats, quite warm/humid and often a lot of noise. Not at Fletcher’s Cottage Spa. Oh no, you are presented with your own changing room dear blog reader! It houses an amazing shower, bathrobe, fluffy towels, massive mirror, hairdryer, face products, Salt of the Earth Deodorant, GHDs, toilet …. and your own private changing space with plenty of room for your your belongings. Once changed you can pick a locker in the corridor outside to deposit your clothes for the rest of time you are there. When we got to MS’s changing room I asked her what she thought …. “love it!”…. I didn’t expect any other answer. On one of our many countdown to Archerfield messages, MS had asked what she needed to bring on the day and if she needed to take a swimming costume. Naturally I took the opportunity to joke with her and say that most people just walked about naked but you can wear pants if you want to. After a suitable amount of time I explained that I was joking and that she probably didn’t need her swimmers because Fletcher’s Cottage supply fluffy robes, slippers and Kikoy wraps, from Kenya, for you to wear in the Thermal Area. (To be fair yesterday was actually the first day I have ever seen people in swimming costumes). There is something about this spa that utterly captivates me. If I had to do my full #12spasof2016 at Fletcher’s Cottage I could easily do that. They have got “how to spa” spectacularly right and I have barely scratched the surface on their treatments list! I can thoroughly recommend this gorgeous haven. There is some chat from my friends that we may make a return to the “mother ship” for a 40th birthday celebration next month … I could not think of a better place to come and relax with friends. Look out for my review of my treatments at Fletcher’s Cottage coming soon! Next Post How to bathe …. the Seaweed way!